My previous article addressed Prospecting – specifically Cold Calling – as a key performance metrics that Sales Managers should focus on to proactively help Sellers. This article will focus on another category of Prospecting, Account Penetration. 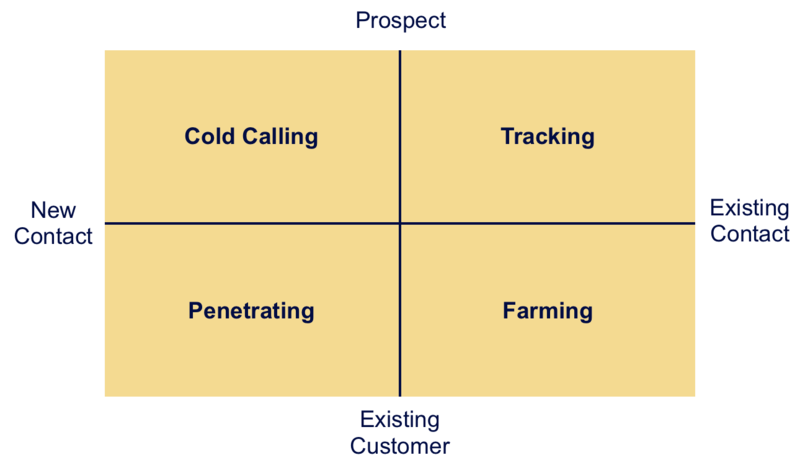 To differentiate the two, lets look at Prospecting more broadly by looking at The Four Quadrants of Prospecting™. Cold Calling: Targeting a Prospect Company and a Buyer you have no relationship with. Account Penetration: Targeting an Existing Customer but a Buyer you have no prior relationship with. Farming: Targeting an Existing Customer and a Buyer you already have a relationship with. Tracking: Targeting a Prospect Company but with a contact you already have a relationship with. This is an important yet often overlooked quadrant of great opportunity. The idea is that when an Existing Contact leaves an Existing Customer, you should track them and their role in their new company. Thus, Account penetration targets companies that you currently do business with, but Buyers (in those accounts) that you do not yet do business with. To be successful at Account Penetration the Seller needs to be capable of executing prospecting processes modified for a penetration strategy. Importantly, the Seller must be able to effectively leverage existing client contacts (referrals) and their company’s past success in the account, to generate new leads and business. He or she must be capable of developing and executing an account penetration program. Golf, lunch, dinner, and social events are not key elements of the plan; anyone can do that. But the things that are really important – which can start a Seller on the path to becoming a Trusted Advisor – are those activities that lead Buyers to conclude that the Seller is someone who can really help them solve Critical Business Issues. The monthly NOC number should also be used to measure account penetration. By way of review, a NOC is achieved each time an opportunity progresses from the ‘S’ or Suspect Stage directly to a ‘C’ (by far the most common), ‘B’, or ‘A’. For a closer look at these stages, see my brief video on No Wiggle-Room Opportunity Stages. A Seller’s monthly NOC objective vs. the actual NOC’s achieved should be reviewed at each month end. A plan to alleviate any NOC gap and, if warranted, the appropriate skill development plan should also be put in place. Identify how many wins a Seller must achieve in a year to make their quota. Divide the number of wins needed in a year by the probability of a NOC generated through account penetration becoming a win. This number represents the number of Suspects the Seller must generate in a year. Divide that number by 12, which will give you the desired monthly NOC number for a Seller. In an Account Penetration scenario most of my clients increase the Suspect close rate from the 10% used in Cold Calling to a somewhat higher percentage. Not atypically this percentage is 20% or 30%, reflecting the past position and previous success in the account. For example, if your company has a long, rich, successful history with an account, especially if you are viewed as a trusted advisor, it stands to reason that a Suspect will have a much higher probability of becoming a Win for you. Our next article will cover Surgical Performance Metrics for the skill of Solution Development (aka Need Development). Take an even more detailed look in our Best Selling sales management book, Create the High Performance Sales Environment®. Are You Running a “Level 4” Sales Operation? Is Your Sales Operation Run Like a Dictatorship? The “Wild West”? Constitutionally? Adventace® "arrived" in 2001 with the mission of helping our clients become "ace" selling organizations. Since that time we have evolved to become a global sales management consulting firm whose promise is to help our clients Create the High Performance Sales Environment®.